The USTR has announced that the Section 301 China Tariffs applicable to List 3 will not be increased to 25% until March 2. Trade negotiations continue between China and the United States leading up to the deadline. There is still no exclusion process for goods subject to tariffs in round 3 of the Section 301 proceedings, as was done in the first two rounds. JPMA continues to advocate for an exclusion process on behalf of the industry. JPMA remains active on the Executive Committee of the Americans for Free Trade Coalition, to fight against imposition of China 301 Tariffs. Read more about this initiative here. We encourage you to visit this page often for important updates. For questions or comments, contact JPMA's Managing Director, Lisa Trofe at ltrofe@jpma.org or JPMA's Executive Director, Kelly Mariotti at kmariotti@jpma.org. JPMA Members, click here for more information. 301 tariffs have significantly impacted the baby products industry, and put babies and children at risk by making life-saving products like car seats, cribs and many others less accessible. We need your help to ensure this message gets out to assist with our advocacy and request for an exemption process. Starting immediately, please share this graphic on all of your social media outlets using the hashtag #nobabytariffs, and forward to anyone you know who will help spread the word!!! We've included some ideas for posts below (or feel free to use them as-is)! "Baby products must be exempt from the China 301 tariffs! These products save lives and protect our children. 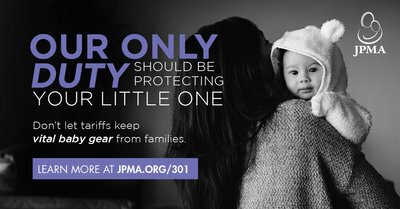 #nobabytariffs"
"Tariffs on baby products put our babies and children at risk. #nobabytariffs"
China Trade War: Where Are We Now?